Subways run in all major cities in Brazil. The system will vary from city to city, ranging from lines that stop only in major centers to those with more localized routes. Passengers should familiarize themselves with the line by using maps displayed on the wall near underground token vendors. Vendors are generally available to answer questions. 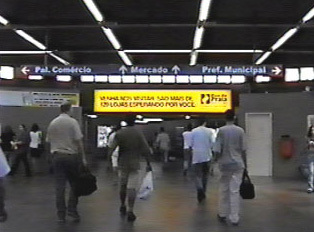 Subway running times vary from city to city; therefore, a traveler should find out when the subway opens and closes before making plans to use it. It is best to use the subway only when fairly certain of both the route and at which stop to get off. Pay close attention to personal belongings, and always travel in groups late at night. Public restrooms and telephones can be found near most subway stops. "How to Ride the Subway"